Prediction Time! Here is my prediction for tomorrow's election. Clinton gets 323 electoral votes powered by close wins in North Carolina and Florida and is elected the 45th President of the United States! Nevada also goes to Hillary Clinton on the strength of early voting and strong support from latino voters. 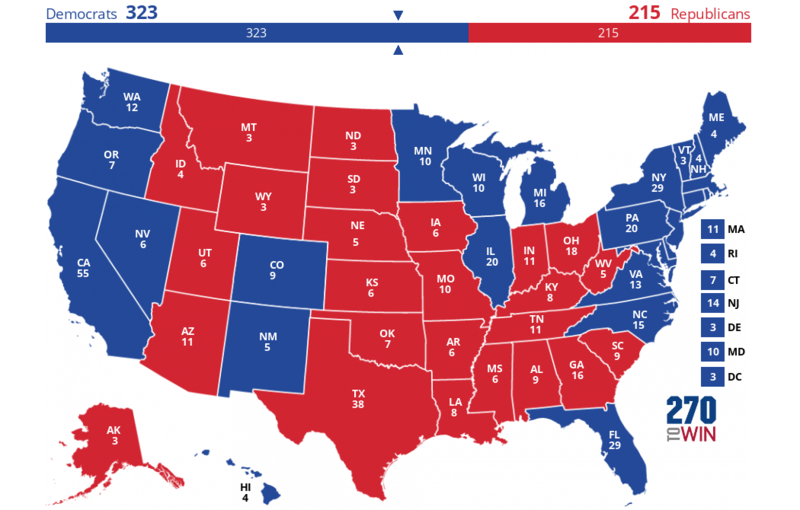 Even if NC and/or Florida go for Trump, Hillary gets to 270 with wins in the western states of Colorado and Nevada. Ultimately, Trump's lack of a ground game to get out the vote makes the election far less close than it would have been otherwise. I also predict the Senate ends in a 50-50 tie. I think the Democrats win Senate races in PA - McGinty; WI - Feingold; IL - Duckworth; and one of the 3 Senate toss-ups either Bayh in Indiana, Hassan in New Hampshire, and/or Kander in Missouri win their races against GOP incumbents. With a 50-50 tie Vice President Kaine will cast the deciding vote for Democratic control of the Senate. The House of Representatives stays in GOP hands, but with Dems picking up about 15 seats and having more Democratic votes cast for Congress than GOP votes, but the GOP retains the majority due to redistricting lines of Congressional Districts. That's my federal level predictions. What do you think? And please, go VOTE!